Civilian deaths and injuries in from explosive weapons rose by more than a third last year, against a downward trend globally, according to a survey seen by the Guardian. Most of the 4,260 civilians killed or injured in explosions in the country in 2018 – up from 3,119 in 2017 – were victims of suicide attacks, found by Action on Armed Violence (AOAV). The findings follow a UN report last year that warned the killing and maiming of civilians in Afghanistan, mainly by IEDs, had reached “extreme levels”. 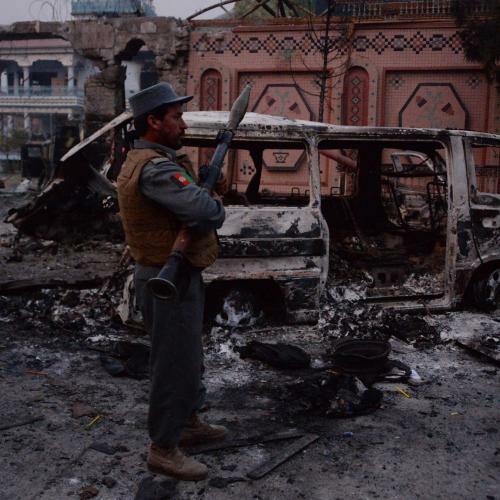 In October, the UN assistance mission in Afghanistan (UNAMA) expressed “serious concern” over a record number of deliberate and indiscriminate attacks on civilians by anti-government elements in the country. “Despite such positive news globally, once again, IEDs are causing more civilian casualties than any other type of explosive weapon,” said Iain Overton, executive director of AOAV, a charity dedicated to reducing the impact of global armed violence. IEDs were responsible for 42% of civilian casualties from all explosive harm, while airstrikes caused 32% of harm. Ground-launched weapons caused 15% and attacks using multiple explosive weapons 9%. Other countries where civilian casualties rose were Ethiopia, Gaza, Iran, the Philippines and Malaysia. The overall decrease in civilian casualties worldwide was largely due to the short-term defeat of Isis in Iraq and Syria, Overton said, as well as the decline of Boko Haram in Nigeria. Liam McDowall, a spokesperson for UNAWA, the agency in Afghanistan that provides details of civilian casualties to the security council, said its next report was due out in February. According to the latest UN figures, 8,050 civilians died or were wounded overall between January and September 2018. The use of suicide bombs and other IEDs by anti-government elements accounted for almost half the casualties. The UN expressed grave concern over the increase in direct targeting of civilians, including ethnic and religious minorities. McDowall, who said he could not comment on AOAV figures, confirmed that 2018 had brought a “record high” in civilian casualties in Afghanistan for the past four years. Before 2014, the majority of casualties were the result of ground engagement between Afghan forces and insurgents. Civilian deaths and injuries in Yemen rose from 1,670 to 1,807 last year, a rise of just over 8%. India had a 21% rise, from 267 to 322, while in Libya there was a 140% increase, from 163 in 2017 to 392 in 2018, according to AOAV. In Syria, civilian casualties dropped from 8,767 to 5,061. Despite the overall drop in civilian casualties in Syria last year, there was an “alarming escalation” of civilians killed and injured in US-led coalition airstrikes during the final months of 2018, the report found. This increase accounted for 65% of casualties in Syria during that three-month period. Countries in which there was a significant decrease in civilian harm from explosive violence included Somalia, with a 48% fall in civilian casualties, Pakistan (48%) and Iraq (77%). The AOAV report was compiled using data from sources including Airwars, the Armed Conflict Location and Event Data project, the Syrian Observatory for Human Rights and reliable media sources.